While the majority of the adolescent pitching population is busy this offseason shortening their pec minors on the pec-deck, we’ve got our guys and gals performing thoracic mobility drills aimed at actually improving pitching performance and velocity. Besides just improving the overall functionality of the student-athlete, incorporating thoracic mobility drills (both extension and rotation) are going to improve their abilities in the “cocking” or “layback” phase of the wind-up. 2) He or she has complained of, or have battled chronic, elbow, shoulder, and lower-back pain throughout their career. 3) His or her fastball couldn’t breakthrough a wet paper-bag. Did you know that approximately 1/3 of all workday illnesses are the result of elbow/wrist/forearm injury? That’s 33.3% for those of you who prefer percentages. In fact, these injuries account for a greater loss in wages and productivity than ANY OTHER ANATOMIC REGION (i.e., the lower back that always gets so much attention)! What’s the Function of the Elbow? The true function of the elbow is to transfer energy from the shoulder to the hand. This transfer then allows for extremely precise and forceful movements to occur simultaneously. So, the elbow’s ability to function pain and restriction free is pretty darn important for daily living. 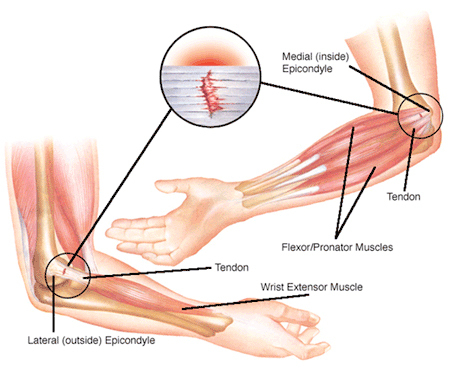 Most of the time there is some sort of tendon related issue causing the problem in the elbow, wrist, or forearm. The risk factors for all of these injuries are similar and include virtually any repetitive, hand-intensive, and forceful tasks. Some examples include electrical work (I know this first-hand as Ryan had an extremely painful bout with elbow pain about 7 years ago), barbell bench press, tennis, golf, rowing, baseball, softball, basketball, all throwing, construction work, gardening, etc, etc, etc. The aim of injury prevention and treatment is to attempt to limit range of motion temporarily, limit the repetitive task causing the pain, to strengthen the area, and address muscle tissue and tendon quality in the immediate and surrounding areas. De Quervain Syndrome: an inflammation or a tendinosis of the sheath that surrounds the two tendons that control thumb movement. No doubt a comprehensive and focused corrective exercise program is in order to address issues of the elbow/forearm/wrist. But, to arrive at a solution, a number of assessments should be conducted to uncover the root of the problem. Several common assessments include: Brachialis Limitation Assessment, Long Head of the Biceps Limitation Assessment, Active Wrist ROM Assessment, and a simple Wrist Limitation Assessment. Isolated strengthening for elbow flexion, elbow extension, wrist flexors or extensors, and wrist supination and pronation – these selected exercises should be heavy on tempo with great focus on the eccentric and isometric portions. Integrated dynamic movements – these are basically more complex movements that, depending on severity of pain, may need to be worked into after addressing steps 1-3 over the course of several weeks. As with all other portions of the body, dysfunction at one joint is often linked to dysfunction at other joints. In the case of elbow/forearm/wrist dysfunction, one should always look up the kinetic chain to the shoulder and check to find out if there is any impingement syndrome or instability, as these will often be found in conjunction with lower arm problems.